Just like Superman had Kryptonite as his weakness, I have one as well – shopping on-line. I love shopping while sitting on my couch or in the office looking for the perfect clothes. As you may already know I'm from Spain, and I go back home twice a year. Living in Sydney, Australia, that means I travel to the opposite season at least twice a year. I shop my clothes (and all family's clothes) beforehand, so when I arrive to Spain, we have some new season clothes to wear waiting for us. Online shopping is a great way to find pieces that really match your true, unique style. There are thousands/millions of on-line stores nowadays that I enjoy. I say ‘enjoy’ because not all on-line stores tick all the boxes to be my perfect match. I need them to be clear, easy-to-navigate and stylish, of course! 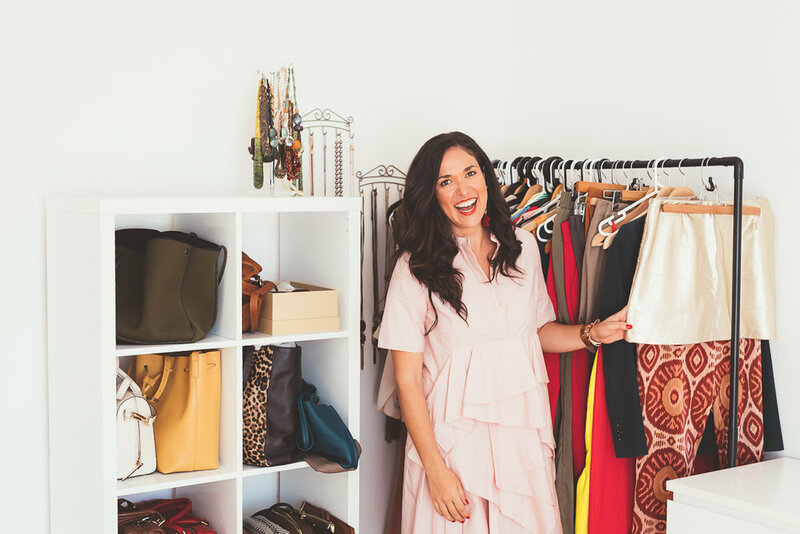 Some of my favorite ones are Shopbop, Asos, Net-a-Porter… and many more that I include for all my fab community in my Style Power Course. There, I include a full Shopping Guide by Style. Every country has different sizing systems. Make sure you measure yourself properly when you are buying clothes on-line so that you choose the right size. I.e., a size 6 in Canada is a size 38 in Spain and a size 10 in AUS, NZ & UK. Talking from experience here: it can be very frustrating making a mistake like that, duh! Time to check if that dress fits. I.e., make sure the waistband of the dress worn by the model, is not transformed in a “hip-band” or a “breast-band” worn by you - same applies to jacket lengths, skirts, pants, etc. The model proportions are different than yours which is why many sites detail the information about the model and clothes measures to help you to have a better idea of the dimensions. This is the moment when getting to know your body and what looks best on you (color, shape, style), plays a very important role here. Take a good look at the product description. We all know how powerful a good camera and good lighting can be to make something look very different from reality. This applies in a huge way to color as well. If you aren't sure, always send an email to the company and they'll tell you the information you need. Always find out where the merchandise is coming from and how much the shipping cost is BEFORE purchasing your order. Once, I fell in love with a beautiful jacket, the one that I ordered in the wrong size by mistake - when I received it I realized that if I wanted to exchange it for the right size I had to send it back to Korea! Whaaaaaat!? Well, that was more expensive than the jacket itself!! There's no better learning than experience; that's for sure...! Also- Nowadays, I don't buy it, if I need to pay for a return or exchange. At least if this is not a piece that I've already tried on in other occasions or I know for sure it's going to fit. There are some companies, that they actually send you the product with the return shipping tags, to make your life super simple. You gotta love that! Make sure the online store is safe; you're going to give them your credit card number. Go for this options A) an official brand store or B) a trusted multi-brand store. You'll find some reviews on the internet, don't hesitate on doing some research if you're not completely sure about the page you're browsing. This will help you to avoid the many frauds that exist on-line… buyer beware! Online shopping is a great way to find pieces that really match your true, unique style and get great deals. Get this virtual magic going, if you haven't started yet. I'm here with you! Start with brands you're already familiarized with, and know they match your style and body shape, and have fun shopping! Now, it's your turn; I'd love to know how much you shop online and if you aren't doing it already, did this help giving you some courage to do it now? You can post your comments below! I'd love to know. Also, are you a member of my tribe already!? If you aren't, make sure you sign up here, to have access to my most exclusive tips and deals, that I only share with them.